It's that time of year again, and Col. Brown has his endorsements. I'd agree with all of them. 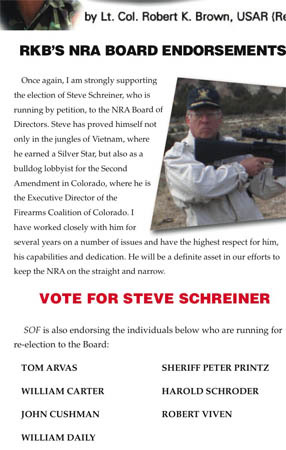 Steve Schreiner would be a great addition to the Board. He's on a committee right now, and if he's ever missed a board meeting, I can't remember it. Bill Dailey, a Harvard-educated attorney who prefers to practice in Moline ILL, is just indispensable to NRA. He chairs the Civil Liberties Defense Fund, sits on every law-related and legislative committee. Smart as hades, and the only board meeting he ever missed was when he had to have a heart bypass. He sits on eight committees (average director has four), so he's really handling double the workload. Budd Schroder is a hardworking gun activist from NY State, which is a trial in itself. If we vote the right people onto the board, can they give Wayne LaPierre the boot? Who gets to vote in the elections?